In large saucepan, combine dried fruits, broth, 1/4 cup of the apple juice, margarine, cinnamon and nutmeg. Bring to a boil. Stir in stuffing mix. Remove from heat. 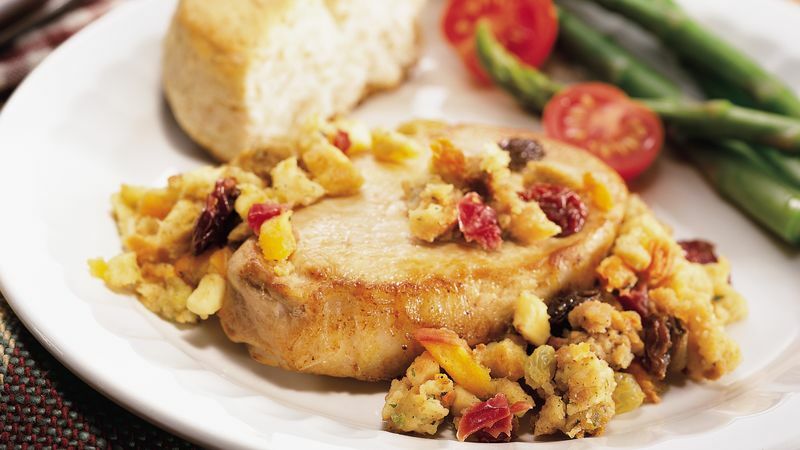 Arrange pork chops in bottom of 3 1/2 to 4-quart slow cooker. Pour remaining 1/4 cup apple juice over pork. Sprinkle with salt and pepper. Top with stuffing mixture. Remove stuffing from slow cooker; place in serving bowl. Stir gently; serve pork with stuffing. *If a package of the dried fruit mixture isn't handy, use 1 cup of your favorite chopped dried fruit, such as apples or apricots, instead.